I had a mad hankering for peanut sauce the other day. Not anything that traditionally goes with peanut sauce, like a beef or chicken satay, just the actual sauce. So off to the interwebs I went. And that's when I found Cooking with Amy and a really great recipe with a slew of suggestions for variations. Since we all know how much I love to play with ingredients, this was the perfect peanut sauce recipe. The picture was rushed because A) I was starving by them time I finished cleaning/searing the scallops, frying the polenta, and plating it on some yummy red leaf lettuce, and B) see A. Yes, I know it could use some color. Maybe some red bell pepper or carrot matchsticks would have lent more visual interest and even texture/flavor. But again, see A. Some notes: Amy's recipe called for natural peanut butter. I had a generic, so in it went. It also calls for 1/4 cup of coconut milk. Wasn't in the pantry, so I substituted more water. Finally, the "secret ingredient," or the one I chose from her list of optional additives, was Worcestershire sauce. It was a damn good choice. Below is the edited recipe pictured above. Whisk everything in bowl, adding the water last. Pour into a small saucepan and heat over medium heat until sauce begins to bubble and thicken. Serve hot or cold. 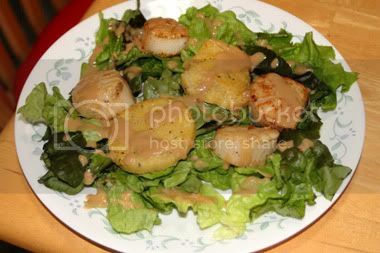 As you can see, I used mine as a dressing over a monochromatic array of seared scallops and polenta, delicately thrown onto a bed of greens, since it was a rather thin sauce (at least in comparison to most satay sauces I've had in Thai restaurants). I really enjoyed this one. It's going to become one of my standard, go-to dressings.